The Trump administration announced last week that it would sign two executive actions to launch a review of U.S. trade policy. A review of trade policy and its potential to harm U.S. workers is welcome and long overdue. However, the specifics of the review offered by President Trump mean that it is likely to fail to provide any help to American workers, in part because it asks the wrong questions. The president’s first order requires Secretary of Commerce Wilbur Ross and White House Trade Council to “identify every form of trade abuse and every nonreciprocal practice that contributes to the U.S. trade deficit,” according to the commerce secretary. The report is to be completed within 90 days, with an analysis of the detailed cause of the deficit “by country and major product.” But the trade deficit is not a “product by product” or a “country by country” problem. We know what it is caused by and what should be done about it. The trade deficit is not a bilateral problem between the United States and individual countries. The U.S. trade deficit is a result of global trade imbalances. There are ten to twenty countries that have developed large, persistent, structural trade surpluses that are distorting trade flows worldwide. The top ten surplus countries are shown in Figure A below. In 2015, these countries, led by China, Germany, Japan, Korea, and Taiwan, had a collective trade surplus of approximately $1.5 trillion. (The figures reported are current account balances, the broadest measure of trade in goods, services and income.) The United States’ current account deficit of $463 billion in 2015 accounted for less than one third of the total surplus accumulated by the big surplus traders. Other countries have also suffered from persistent, structural trade deficits, job losses, and downward pressure on wages, including Great Britain, Brazil, Australia, and Mexico. Attacking the root causes of global trade imbalances will benefit all deficit countries, and not just the United States. The causes of global trade imbalances are also well known. While dumping, subsidies, and massive amounts of excess production capacity in some industries (e.g. steel, aluminum) and some countries (e.g., China, Korea, Japan) are an important cause of the problem, the single most important cause is currency undervaluation. Countries with larger, persistent trade surpluses have undervalued currencies. 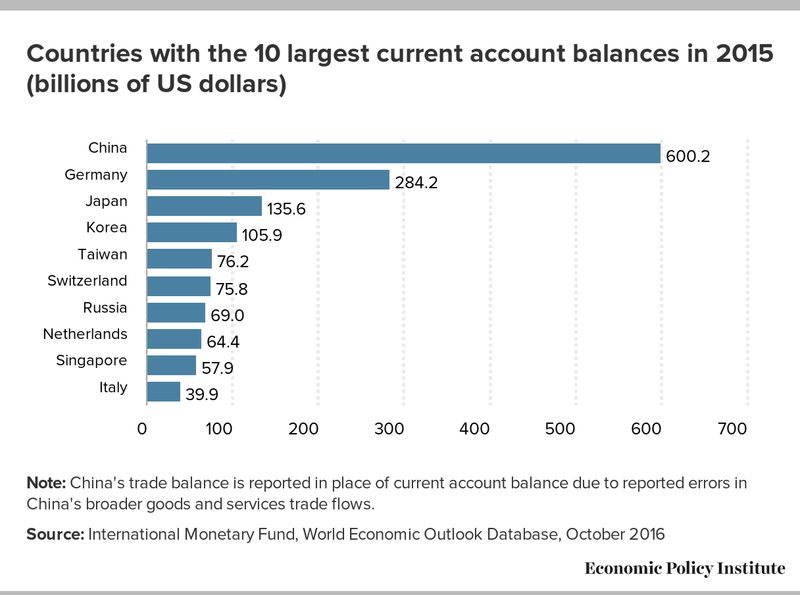 Rebalancing of major currencies, last achieved following the 1985 Plaza Accord, is the single most effective way to rebalance global trade flows. Such an agreement is needed to increase (realign) the exchange rates of the major surplus countries shown in Figure A, relative to the U.S. dollar, which is heavily overvalued. The president’s executive orders on trade also “reflected a marked softening” from the heated trade rhetoric used by Trump on the campaign trail in 2016. The announcement also seems to reflect a search for small, specific, trade actions that could yield “tweetable” trade victories. For example, the president’s second order calls for “enhanced collection” of anti-dumping and countervailing duties, to address the “under-collection” of such duties. White House National Trade Council Director Peter Navarro said that $2.8 billion in such duties were uncollected between 2001 and the end of 2016, or approximately $175 million per year. When compared with the U.S. goods trade deficit, which reached $749.9 billion in 2017, such duty “under-collections,” were small potatoes indeed. While recouping these “missing” duties would be good for injured workers and companies, and would create opportunities for regular announcements of trade “victories,” they will have no significant impact on the overall U.S. balance nor on trade related job losses. Small victories on unfair trade, while welcome, will not bring about the currency realignments needed to rebalance trade flows. Voters, Congress, and manufacturers should settle for nothing less. Data on goods trade are reported for China due to problems with Chinese data collection.